Liveaboards in New Britain, or "Niu Briten" as it's known in the local lingo, give divers of all levels the chance to explore secluded coves encircled by steep cliffs, white-sand beaches fringed by reefs and bountiful outlying coral formations, that are only accessible to dive by liveaboards in Papua New Guinea, as few of the island's roads reach the coastline. Formed thousands of years ago by the violent eruption of undersea volcanoes, the waters around this mostly jungle-clad island are also dotted with ship and plane wrecks that testify to the island's importance as a major battle zone during two world wars. Liveaboard diving in New Britain will take you along the northern coast of Papua New Guinea (PNG), to dive psychedelic reefs, drift diving along vertigo-inducing ocean walls, and exploring coral-encrusted sea mounts that disappear down into the inky depths of the Pacific. While along the south coast the rainforest grows right down to the calm lagoon waters filled with all manner of remarkable critters, which are fringed by a coral barrier abounding with life. A dive safari around the island of New Britain you will encounter a huge variety of marine life. Bizarrely-shaped hard corals and soft species in every hue are intermingled with an abundance of barrel and elephant sponges, and an assortment of nudibranchs and tropical fish. At some spots along your dive cruise, especially when there's a bit of current, you should get to hang out with eagle rays, big Dogtooth tunas, barracudas, and the resident grey reef sharks, and you never know when you'll catch a glimpse of a passing sperm whale out in the blue, or a rare sighting of a dugong, cousin of the manatee, among the seagrass in the shallows. Without a doubt, you'll get to play among a selection the wrecks that date from the earliest skirmishes of WWI through closely fought battles of WWII. As you'd expect with an island in the south Pacific, New Britain has a multitude of dive sites to choose from. One of the "must see" diving regions of New Britain is the large Kimbe Bay, off the northern coast of the island. A definitive biodiversity hotspot, the calm waters hide a wonderland of tropical sea life both large and small, including more than two-thirds of all Indo-Pacific fish species among the famous off-shore sea mounts and myriad of reefs. Lolobau Island at the east end of the Kimbe Bay in the Bismark Sea, is home to exquisitely pristine reefs and sea mounts with all the reef and pelagic life you'd expect, and if you are you are very lucky you may even get to enjoy the spectacle as spinner dolphins stop to play. Tavui Point is the tip of a large, mostly submerged volcanic crater, offshore from east end of New Britain. Imposing 1,000-meter (3,000-foot) cliffs encircle the popular liveaboard diving spot known as the Submarine Base, as Japanese subs sidled right up to edge of the reef during WWII. This area offers superb shallow diving amid the flat coral gardens and along the edge of a vertical wall plunging to the depths, awash with schools of tropical fish, pelagics, and sharks, as well as nudibranchs, shrimp, eels and psychedelic corals. Rabaul's Simpson Harbour boasts all kinds of WWII wreckages of both boats and aircraft, from when the bay served as the primary Japanese Naval base in the South Pacific. Relatively calm seas year around, often-unbelievable visibility, and depths ranging from just 5 to 50 meters (15 to 150 feet) make diving these wrecks accessible to all divers. A dive safari here will not disappoint at any time of year, as the smart liveaboard boats in New Britain move their sailing route from northern sites when it gets rainy, to enjoy the drier weather and better conditions to be found on southern itineraries. Be smart with your packing as national airlines are pretty strict on their weight limits for checked baggage, and take important dive gear, such as that sturdy but heavy regulator and dive computer in your carry-on bag. 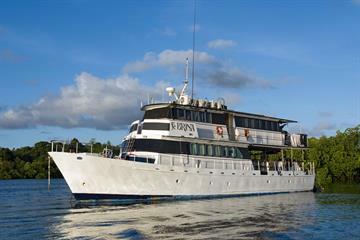 The best and only way to truly explore New Britain is by a liveaboard in Papua New Guinea. Depending on the time of year, dive cruises will depart from either Walindi or Rabaul. There are regular flights to both Rabaul and Kimbe (Hoskins airport) from the main international airport in the nation's capital, Port Moresby.